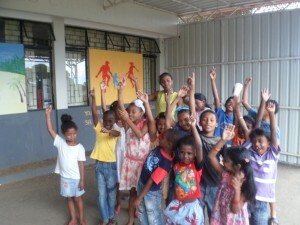 DCI-Mauritius has visited the village of Riviere des Anguilles today to spend half a day with some 20 children. Children from all backgrounds are invited to talk to volunteers and it is also a way for DCI-Mauritius to raise awareness of some key articles under the CRC in a basic language to them. During the session, free drinks and cakes were distributed to everybody present. DCI-Mauritius has scheduled a similar event for January 2013.